Recently I was talking with a group of people who had all lived in Japan. The conversation turned to socks, as it does. Everyone agreed that they missed Japanese socks passionately. 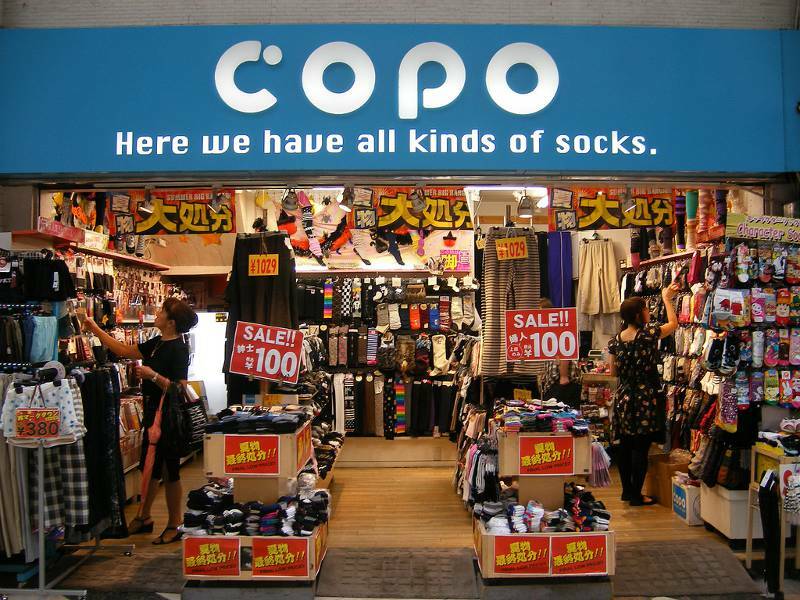 One person, who was taking a trip to Japan, had already earmarked sock-buying time while he was there. 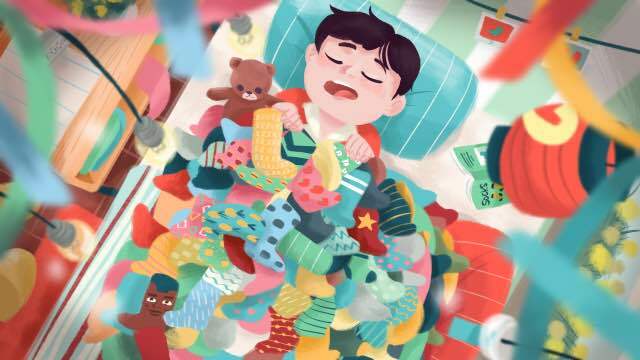 If you haven’t lived in Japan, you might not think that socks would inspire such affection, but that’s probably because you haven’t experienced the wonders of Japanese socks. If we’re going to look at socks, we should start with the traditional tabi. Tabi 足袋（） are ankle high and recognizable by their split toe design and hook fastenings. The split between the big toe and the other toes means they are suitable to wear with traditional Japanese footwear such as geta and zori that resemble sandals with a strap that attaches to the sole between the toes. 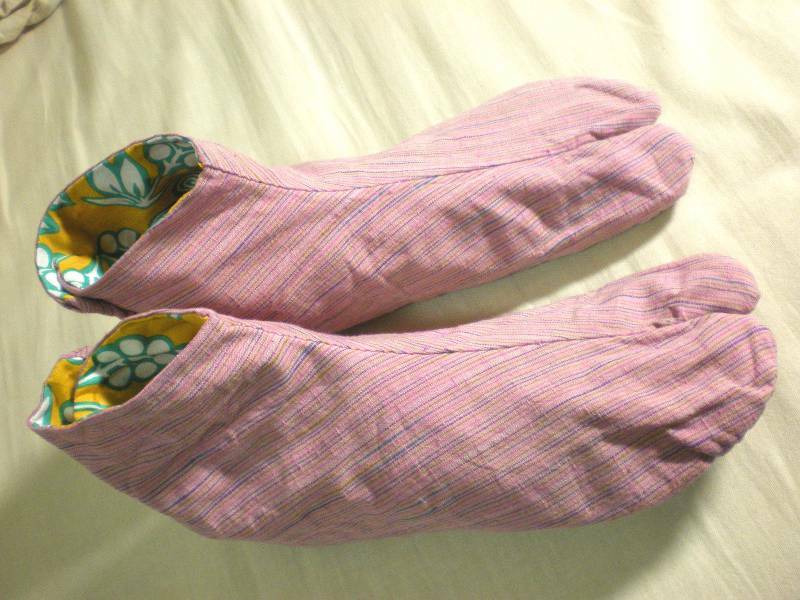 Traditional tabi are made of stiffer material than socks. This is good since it provides some protection for your feet (is it just my weird feet or are zori super painful to wear?). Tabi are still worn today when people dress in wafuku, traditional Japanese clothing such as kimono. I have a pair that were required for a kimono class, and tea ceremonies are good places to spot tabi. The best places to buy tabi are department stores and specialist kimono shops. Unlike a kimono, a pair of tabi are not very expensive. The traditional colours are white and black, but these days you can find all kinds of cute coloured tabi. Jaki-tabi 地下足袋（） are a variation of tabi. They are tabi-boots with rubber soles. 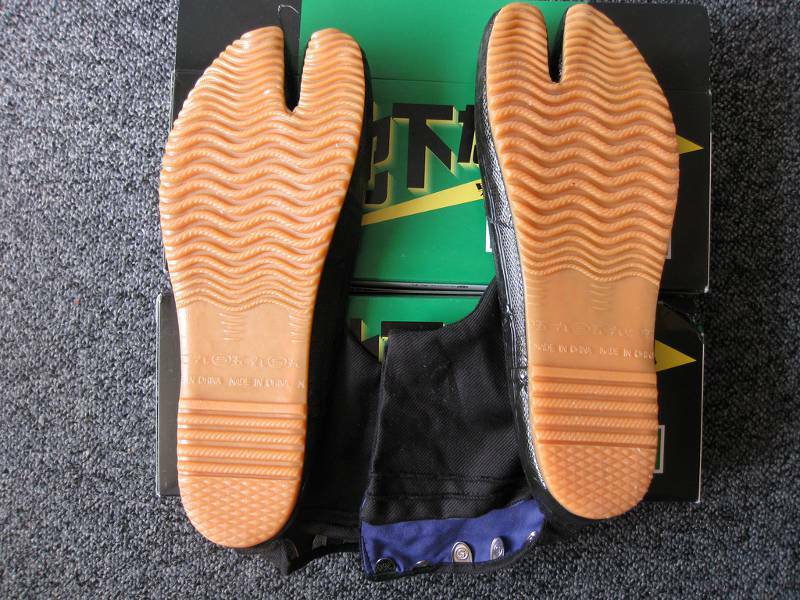 Although they are a 20th Century invention, you’ll probably have seen them on the feet of “ninjas” in movies. In reality they are worn by rickshaw pullers, workmen, farmers and construction workers, though they are not as popular as they once were. 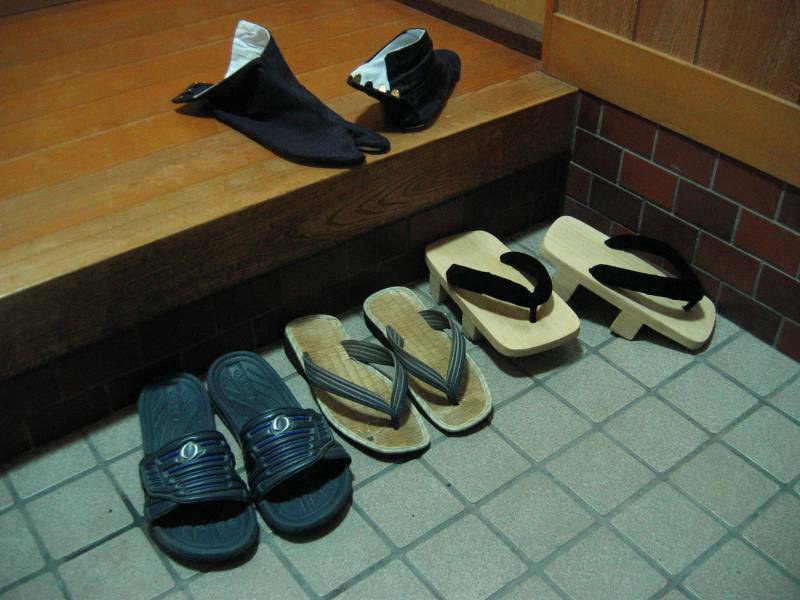 In Japan your socks are on display far more often than in some other countries, thanks to the traditional code of leaving your shoes at the door. Your feet and socks can be on show many times a day and people aren’t shy about commenting on them. Wearing dirty or worn out socks is a big faux pas – if you want to make a good impression, you must have nice socks. There are some regional and generational differences about sock etiquette when visiting someone else’s home. Younger people are often more relaxed. However, there were exclamations of horror as a lady in my calligraphy class told a tale of how a visitor had had walked on her tatami with his bare feet! Outrageous! This is just anecdotal evidence, but I can still recommend wearing socks you wouldn’t be embarrassed by while you are in Japan. Take into account the TPO (that’s a bit of Japanese-English that means Time, Place and Occasion). For example, sports socks are not appropriate in a business setting. But having impressive socks to show off is no hardship, because luckily for you there is a fantastic selection of all kinds of socks in Japan. Modern tabi take the split toe design of traditional tabi and pair it with modern materials. They stretch and pull on like a normal sock and don’t have a clasp closure. Personally, I never found them very comfortable, but some people swear by them, claiming they have health benefits. Split-toed running shoes have also become popular in recent years, so split toed socks suit them perfectly. I’ve noticed a difference between modern tabi socks inside and outside Japan. 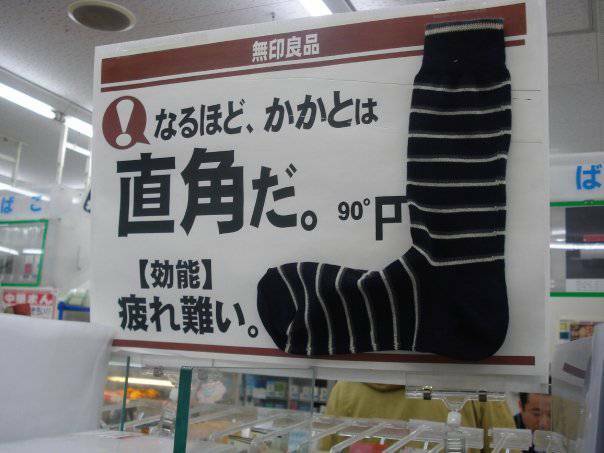 In Japan they are just another kind of normal sock. You can find them in a range of colours, from ones suitable for work to wacky character socks. Outside Japan, where they are available, they still fall into the category of novelties, and tend to be very Japanesey-kitsch, patterned with sushi, ninjas or other Japanese cultural stereotypes. It’ll be interesting to see if they break out and become more mainstream outside of Japan. If one toe split was good, five must surely be better. Or at least that’s the thinking behind ５本指の靴下 gohon-yubi no kutsushita. Five-toed socks are basically gloves for your feet. They were invented in Spain, but popularised in Japan. Japanese researchers at the University of Tsukuba even did research that showed five toed socks improve circulation in comparison with standard socks. They also supposedly help prevent athlete’s foot. 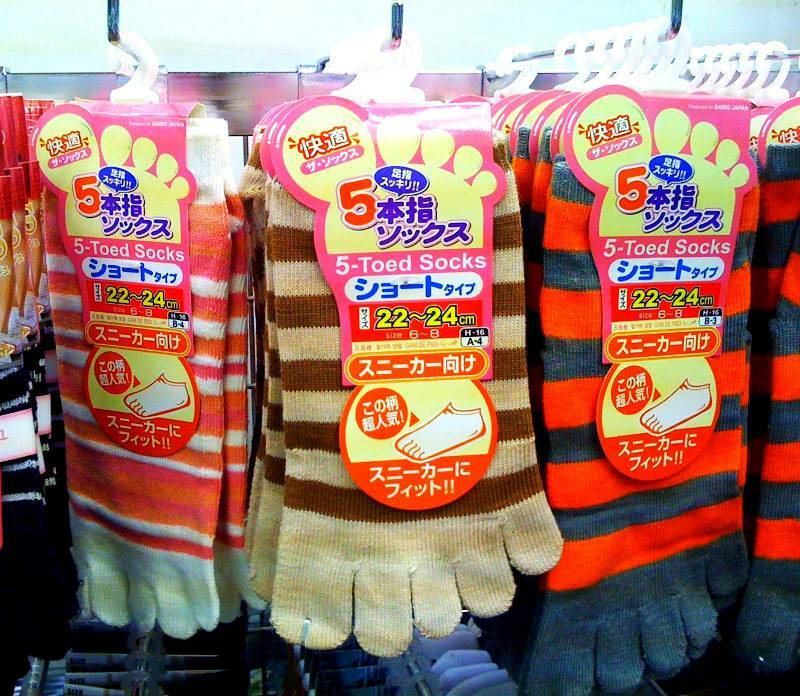 Despite their health benefits, five-toe socks are not considered very fashionable, but if you visit a sock shop in Japan, there will probably be a five-toed sock section. These socks might not be cute, but they are cosy. I lived in Hokkaido, so I valued any socks that would keep my feet warm. 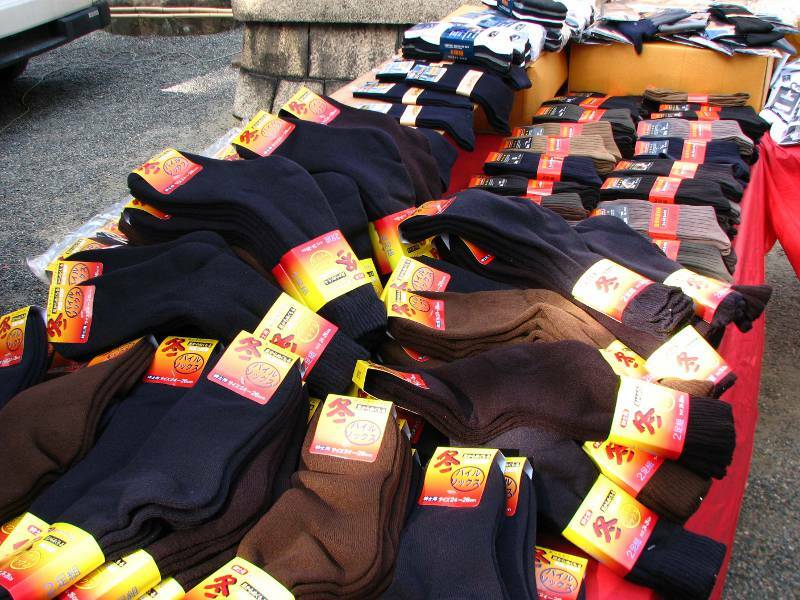 There are many brands of socks which claim to have warming properties. My favourites were Uniqlo’s Heat Tech range and the slightly cheaper versions I could find at my local Aeon department store. Look out for them if you want toasty toes. They are a seasonal item, more common in the winter. There are cooling socks which use a different blend of materials in the summer too. Chances are your favourite Japanese character or mascot comes in sock form. 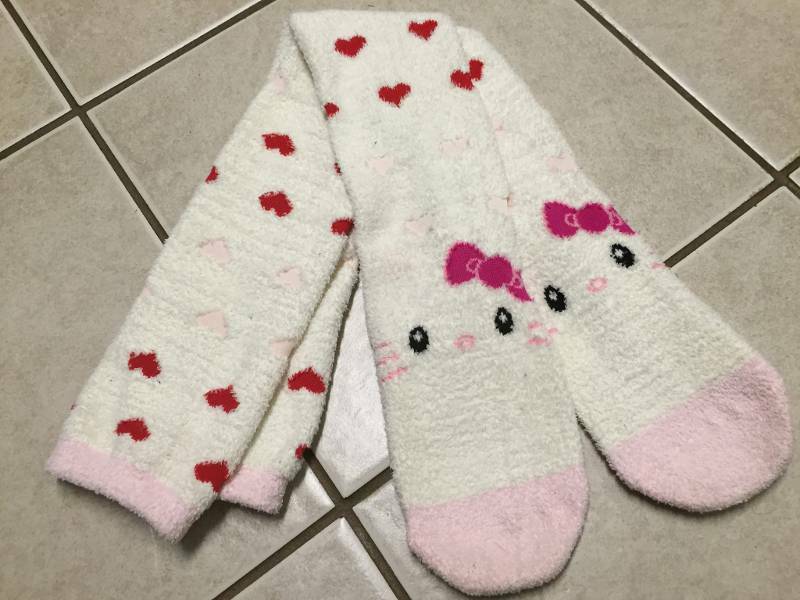 You can find socks emblazoned with the faces of characters from the big hitters like Hello Kitty and Rilakkuma to more obscure characters like Hokkaido’s Marimokkori or the bean dog Mameshiba. 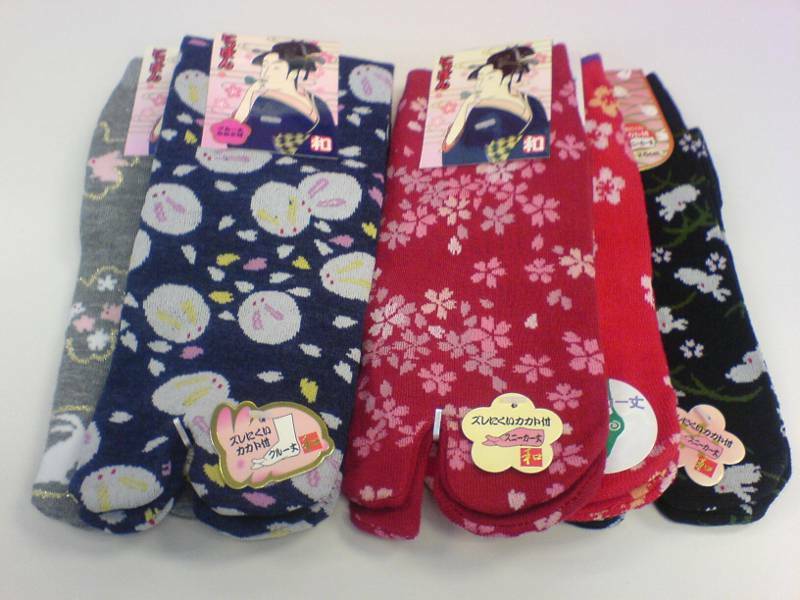 Manga and anime characters also frequently make appearances on socks. Wearing character socks is a fun way to brighten up your day with your favourite character in a subtle way. I haven’t seen screen printed socks much outside of Japan, though perhaps the fashion has spread and I’m just not aware of it. The obvious attraction is that you can have a bright, detailed image on your feet. Woo cute koala feet! The downside is that these socks are usually made of synthetic material so are not as comfy as cotton socks. Whether you want to make that trade-off to have astronauts or macaroons on your socks is up to you. フワフワ or もくもく socks are fluffy just as their onomatopoeic name suggests. Whenever I was chilling in my house, I was wearing fuwa fuwa socks. Thanks to their softness, they are a great alternative to slippers. I bought mine at the 100 yen store. They usually come in pastel colours and cute animal designs. In Japan, even the chairs wear socks. You might be thinking, why would a chair possibly need socks? However, consider that tatami mats were not designed to withstand western-style chairs with legs. 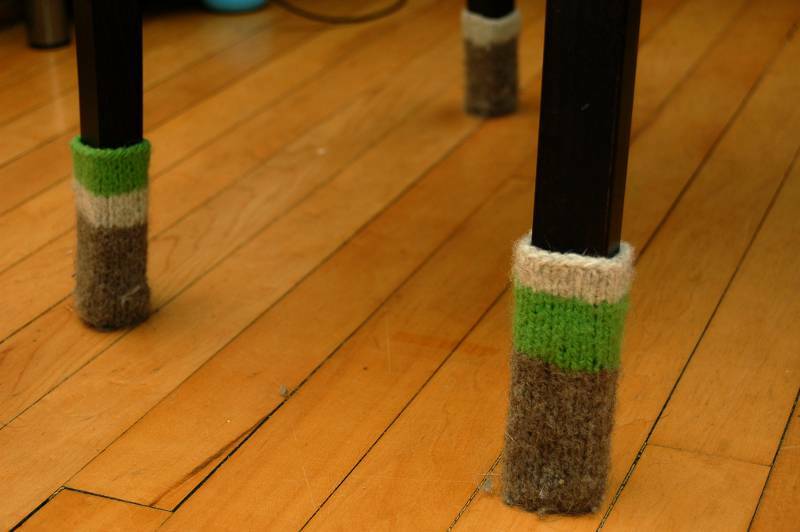 The socks help to keep the chair legs from scratching or denting the floors. If you want to clothe your naked chairs, the best places to find them are 100 yen stores. ルーズソックス Loose socks or legwarmers were a must-have in the 90s among school girls, but it was the gal subculture who went to extraordinary lengths to have the most slouchy socks possible. Some girls wore socks that were longer than their own height in order to achieve an extreme effect. These socks are sold by length, often over 1 meter long and usually come in white. Fashion is a great snake that eats itself, and so in 2014 slouchy socks returned as retro. You can find them in stores that cater to teenage girls. Kon-hai, or navy-blue high socks are the fashion successors to loose socks. In the 2000s, loose socks were out and knee high navy blue socks came in. They are also sometimes called 紺ハイソ or 紺ソク. They are worn with Junior and Senior High School uniforms. They are distinctive for their navy blue colour and for often having a small, embroidered logo near the top. This logo can be anything from a generic horse, to Rilakkuma, to the Statue of Liberty. Of course, the association with school girls feeds into the fetishisation of this section of society. However, in everyday life, they are just normal socks worn by normal girls. Now, I like socks. I like wearing them. They keep my feet warm and comfy. But after doing the research for this article, I’d be a fool not to know that some people like socks for different reasons. Looking for information on Japanese socks can take you to some very sketchy corners of the internet, but an article on socks would not be complete without mentioning of the fetishisation that surround them. 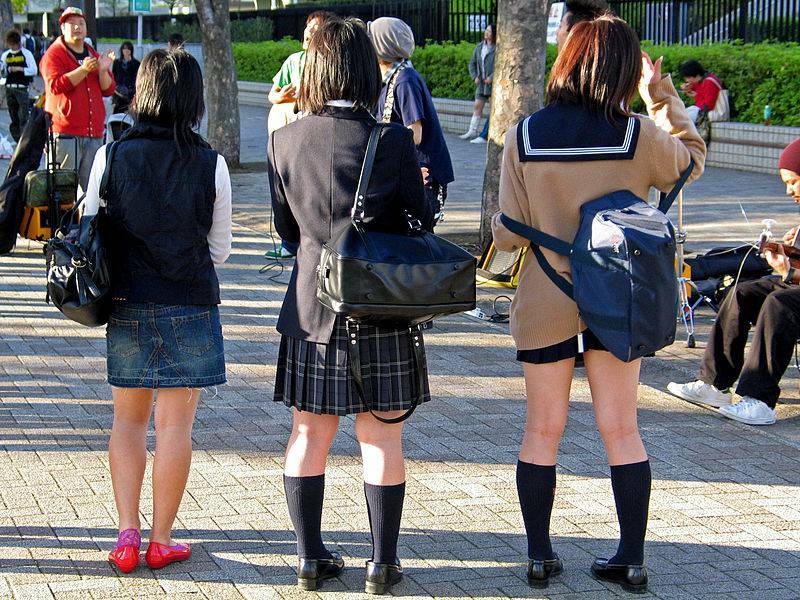 Socks are a part of many school uniforms and are part of the cultural icon status of school girls. Another aspect of these socks as icon is Zettai ryōiki 絶対領域（）. The phrase zettai ryōiki comes from the anime Neon Genesis Evangelion and is a reference to defensive shields. In terms of socks zettai ryōiki refers to the area of skin revealed between the bottom of a skirt and the top of thigh high socks. It is common in character designs in manga, anime and games, as well as in real life, either as cosplay or as a fashion statement. A great amount of mathematical analysis has gone into this phenomenon. This is not really my kind of thing, but as long something it isn’t hurting anyone, it doesn’t bother me. And it certainly hasn’t put me off Japanese socks. It would be easy to fall into the trap of thinking that Japanese socks are just another part of otaku Japan, but reality is far more broad and complex. 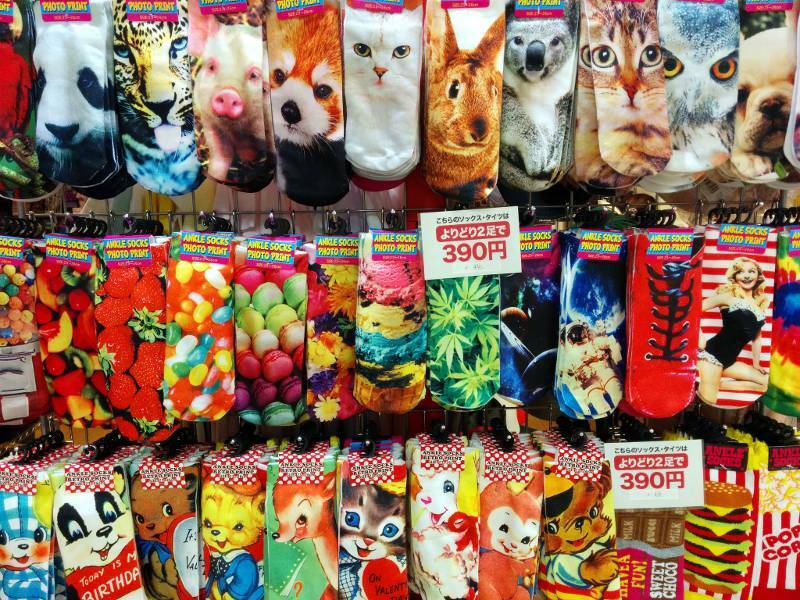 There are socks in Japan for every taste, and now I’m going to tell you how to find them. 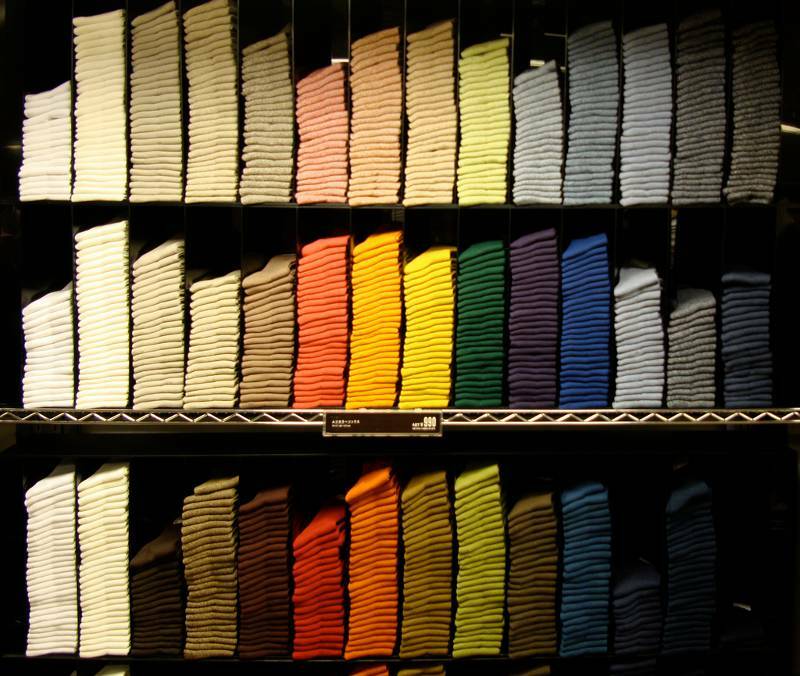 Tabio’s goal is to be the finest speciality sock store in the world. They’ve been opperating since 1984 and seem to have been doing a good job so far. 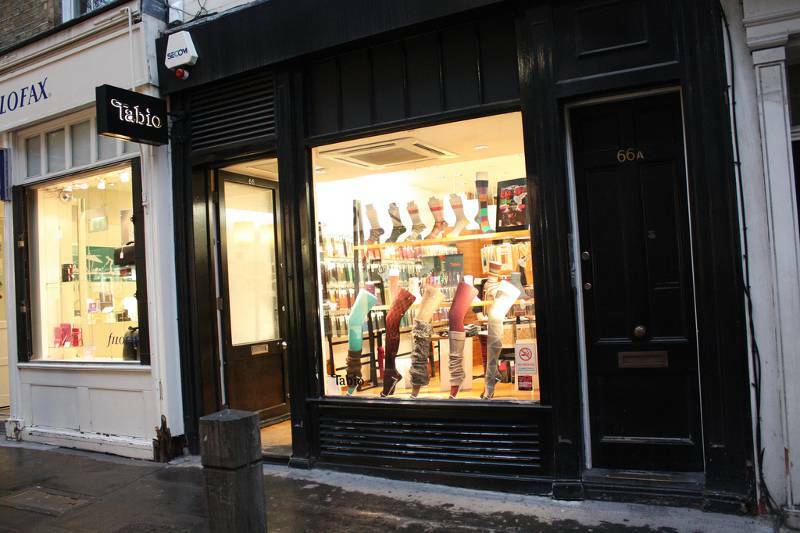 You can find Tabio stores in Japan, France and the UK, but all the socks are made in Japan. Tabio is where you go for grown-up socks. Their range of socks is extensive, coming in a variety of lengths, colours, materials (including alpaca and silk!) and styles. If you are looking for a style of sock, Tabio probably has it, from five-toed socks, to walking socks, and of course a modern version of the tabi sock with a split toe. There is even a whole selection of wedding-after-party socks. 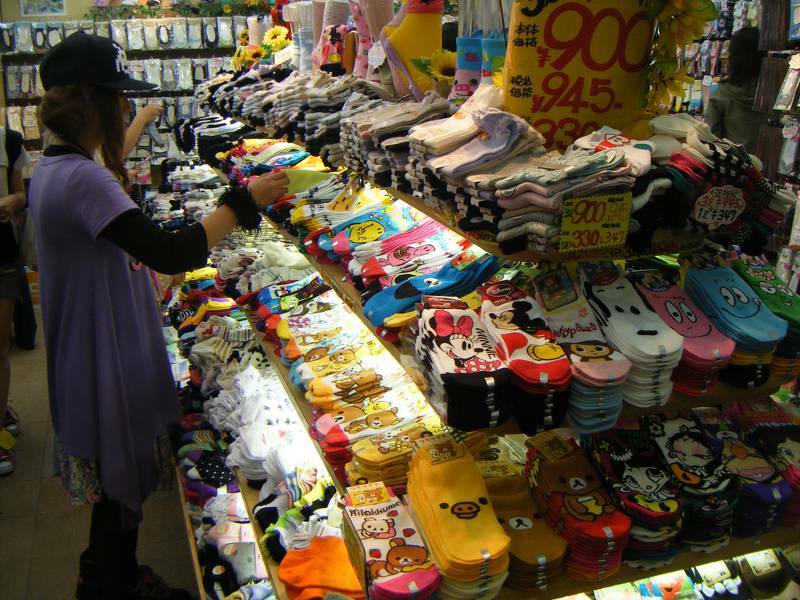 This is the pricier end of the sock market, with socks ranging from about 800 yen to over 3000 yen. Tabio has an English language online store in the UK as well as Japanese online store. My partner is a huge fan of Uniqlo’s men’s socks. They come in significantly more than a rainbow’s worth of colours, they fit true to size, and they last a long time. Before leaving Japan my partner stocked up on Uniqlo socks. He’s slowly adding the unworn pairs to those already in circulation so his supply lasts until he can get back to Japan for more (or Uniqlo comes to Canada.) When a colleague going on a bussiness trip to Japan asked him what souvenir he’d like, he said Uniqlo socks. Such is his love for these excellent and very reasonably priced socks. Uniqlo’s women’s socks are also very nice. They come in a wide variety of lengths, from footies to ankle socks to knee socks, as well as tights. Living in Hokkaido and now Canada, I’m particularly fond of the Heat Tech line at Uniqlo. They often come in two or three packs and the patterns and colours change every season. You can’t go wrong with Uniqlo socks. They are comfortable, colourful and hard wearing and priced reasonably for the amount of wear you can get out of them. You can find Uniqlo stores all over Japan. Luckily for us sock lovers, Uniqlo has expanded overseas too and you can shop online for all the socks (and other clothes I suppose) you want. They might not be as exciting as some other socks, but they are dependable. The no-brand brand Muji has some nice socks. It was my go-to place for comfortable ankle socks that last. Much like most of Muji’s products, they aren’t flashy, but they are good quality. But Muji does have one particularly innovative sock, the 90 degree sock. Apparently the right angle design keeps you from getting tired, although having never tried it, I can’t vouch for that. OK, that’s enough sensible socks. It’s time for some fun ones. 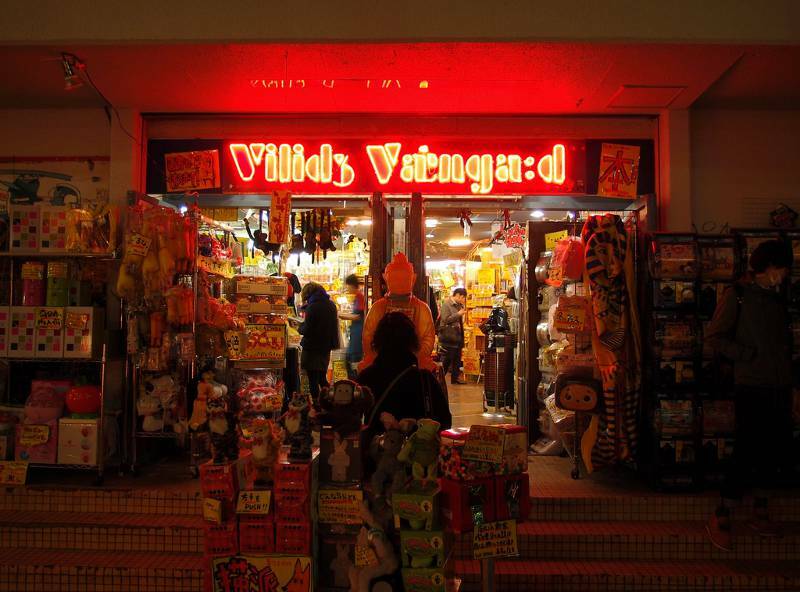 A good place to start is Village Vanguard, which describes itself as an “Exciting Book Store.” Not exactly the first place you’d look for socks. But if you go inside you’ll find a lot of fun socks, particularly character socks, as well as a bunch of other wacky, fun stuff. If you are looking for souvenirs to make your friends laugh, Village Vanguard is a good place to go, and not just for socks. It has an online store, but it can’t recreate the overwhelming experience of visiting in person. Finally, if you are in the US and looking for Japanese socks closer to home, my recommendation is Sock Dreams. This company is based in Portland, Oregon and has a good selection of Japanese socks, particularly modern tabi, as well as socks from the US and around the world. They also have a bricks and mortar shop, if you prefer that over online shopping. The second hint is to look for offers on three pairs of socks. I almost always bought socks in threes, saving money with this kind of offer in many different stores. If you see a display with a range of socks and a sign with the number 3 and a price then you are probably looking at a good discount. Sometimes if you miss the offer, the sales assistant will explain it to you, so if you don’t speak Japanese and someone selling socks is trying to explain something to you, look around for these signs. 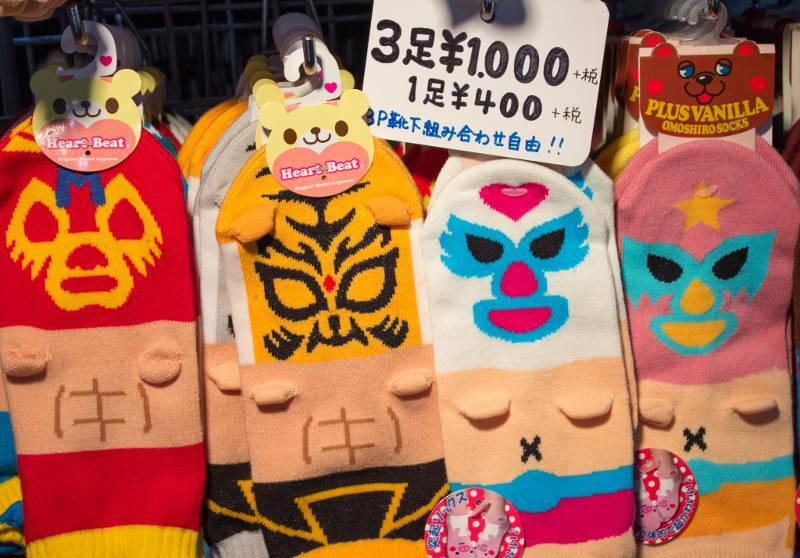 For example, these epic luchador socks illustrate a typical offer, 3 for 1000 yen or 400 yen each. I hope you have happy sock hunting and happier feet!